BAE 312A a favourite for drummers due to it's clear and punchy tone! The BAE 312A Dual Channel Mic Pre features high impedance direct input for guitar and synthesiser. 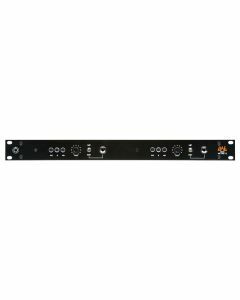 The BAE 312A is available as a 500 series module or a single or dual channel 19" rackmount. Because there are no capacitors in the audio path, the BAE 312A is super fast and punchy, allowing transients to pass easily, making them a favourite for drummers. Made with the highest quality parts including Jensen input and output transformers and the Avedis® 1122 opamp. The BAE 312A Dual Channel Mic Pre also includes a high impedance DI for instruments. Supplied with Jensen input and output transformers. Remote power supply with four-foot cable capable of four times the current needed by the preamps for optimum sound quality. Switches have gold contacts for long life. XLR connectors on the back for mic input and output and phone jack in front for direct input. High impedance direct input for guitar and synthesizer. Separate front panel switches for phantom power.